I'll be using this as a "what's on the workbench" blog for customers & fans to follow, along with news, updates & recently finished commissions! Just a reminder or update for those who may have missed it. If you're a member of Facebook, come visit, and bookmark me. 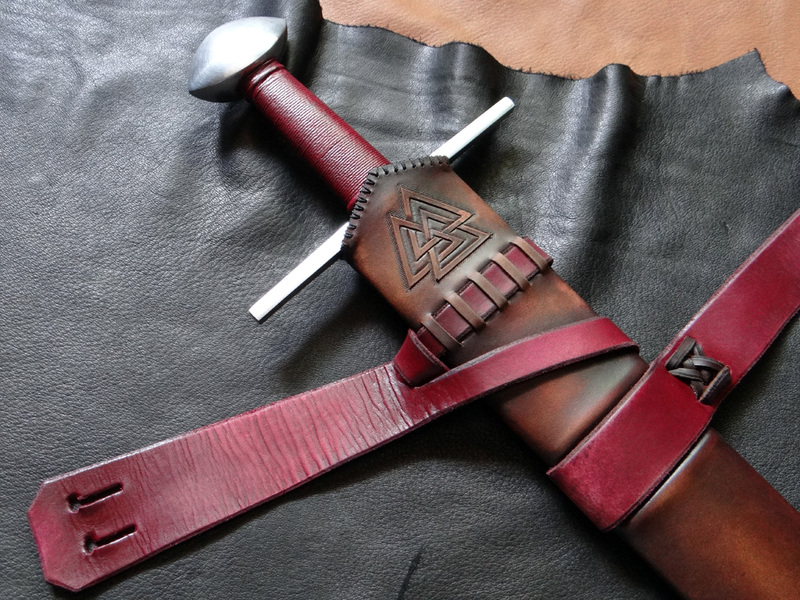 Blogging progress on a Albion Doge Campaign Line scabbard on Facebook if anyone is interested. 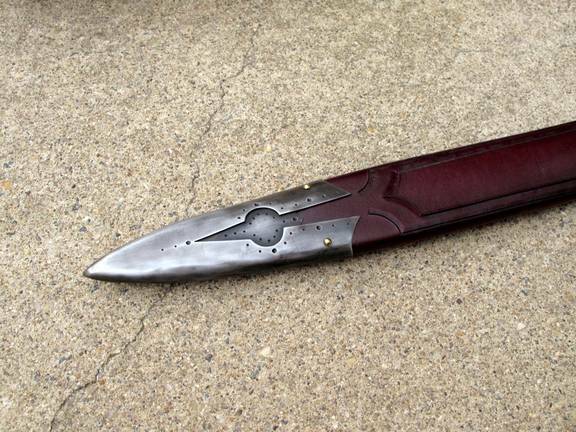 A very complex blade demanding a very complex scabbard. I've been curious to see what you might do with a Doge. I want one of those swords very badly. Here is a sneak peak. Most of the work on this will be the wood core itself, as the leatherwork won't be too detailed with it being a campaign line. In fact, it originally was only going to have a leather chape, but I threw in a pointy brass chape as the customer preferred a metal chape versus leather. It isn't an ideal chape, but it will get the job done. The idea behind my campaign line is form and function with a superb fit for a entry level cost. The Doge is one of my favourite swords: The sword is not that wide at the guard it looks like a long one hander that might not have that much blade presence but this is where the hexagonal section and modest profile taper of the blade gives it much more presence than one would think just looking at the blade. Just tempting you to go for the Doge. Just a bit off Topic how early could these swords be dated too ? Early 16th century at least but maybe even earlier mid 15 th Century ? There are swords much earlier that use a very similar pommel and there are some examples of early 15 Century swords with a finger ring and other types of infantry swords using a knuckle guard, so it might not be completely impossible for a sword like the Doge to be somewhat earlier than assumed i.e. early adopters' versions before they became popular ? Oh, the idea of having campaign scabbards combined with swordless scabbard making is really good. Maybe at some time you might post a list of those swords you have a pattern for that you make without getting the client's sword to do the work ? I know tis works with most Albions but what other brands make swords to close enough tolerances that a scabbard made for one of their sword models has a good chance of fitting all the swords of the same model ? A & A maybe or Del Tin ? Trust me, I know. I had one here and gave it away as a contest prize last year. It was hard shipping that thing away. Just a bit off Topic how early could these swords be dated too ? Last quarter of the 15th century. See the Doge review for a photo of two samples dating 1470. 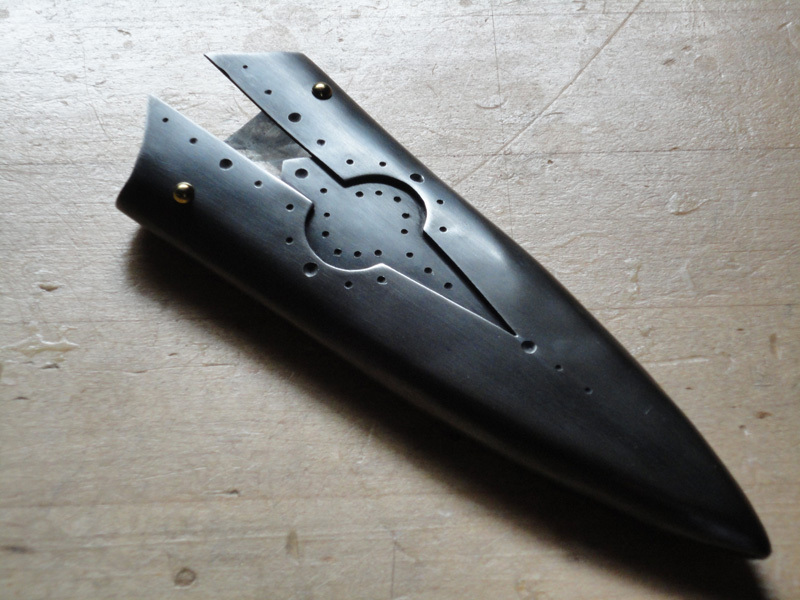 Albion present's the most logical solution, as they cnc mill their blades out and have a meticulous finishing process. From blade to blade there are usually only minor differences. Anything hand made will present major issues, though I am unfamiliar with A&A and Del Tin manufacturing processes. Bottom line is, unless I know for a fact that the consistancy of a blade is going to be depended on for this purpose, it also has to be a popular model, or my investment is not going to pay off. There is also this; I'm getting a little overwhelmed maintaining too many blades and I am already eliminating two or three to help with that. 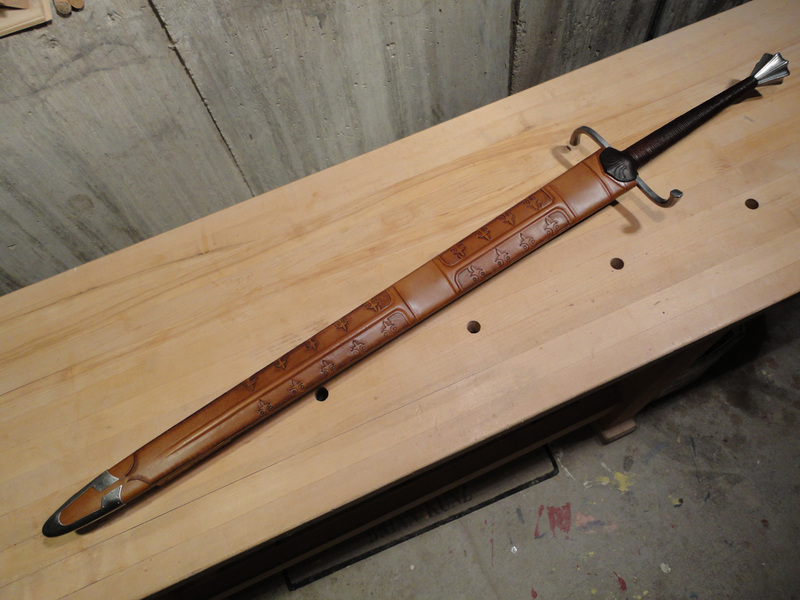 I posted on Facebook some progress pictures of a Albion Svante scabbard I'm working on. It's turning out rather nicely. More can be seen on Facebook. It's been a while since I've posted in this thread. I just wanted bump it up and remind those who might not be aware that DBK is on Facebook! 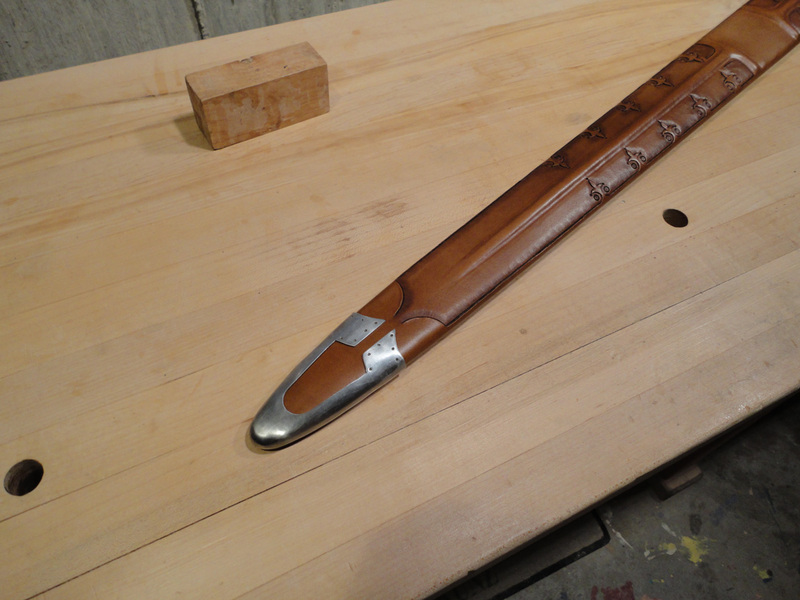 A recent post of mine: I just finished this chape for an Albion Dane scabbard I'm working on right now. 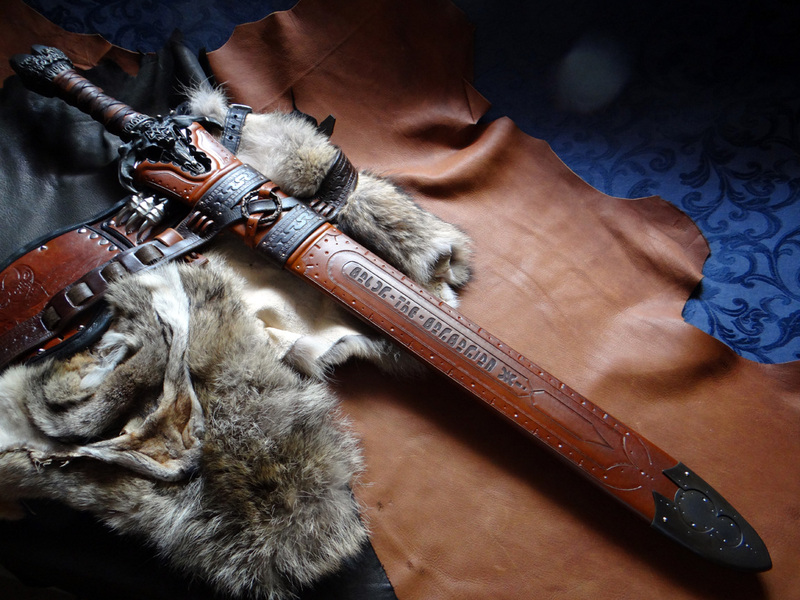 Impressive work as usual and with the " Father's " sword much more appealing than the movie inspired " furry scabbards ". 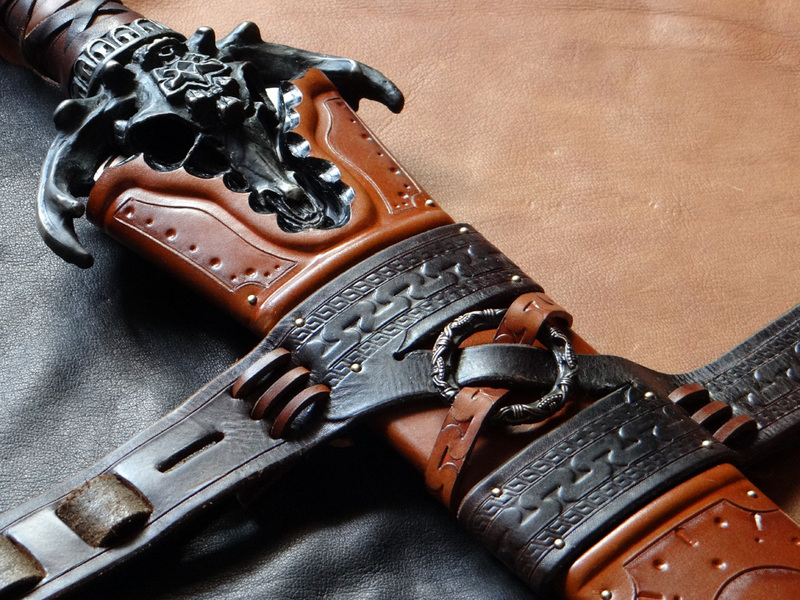 The detailing also seems consistent with the style of the sword and the fantasy inscriptions. 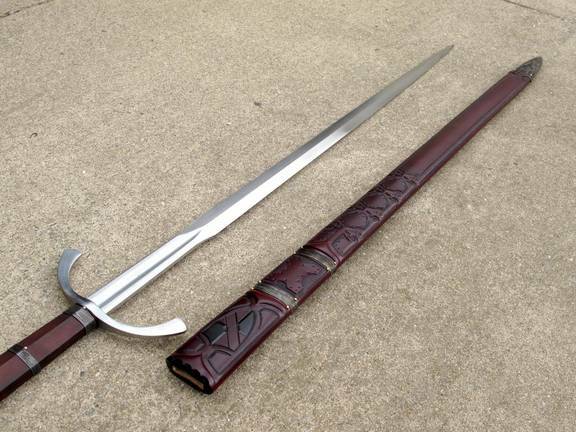 The way the guard is framed by the scabbard opening is almost like the scabbard being a beast swallowing the blade. Thanks Jean. I always enjoy working on 'fantasy' pieces, as it allows for nearly any creative freedom, within artistic taste of course. With Conan being one of my inspirational films growing up, it's always fun working on one I get to create with my own idea's. The waist belt was provided by the customer. I had to figure out a way to attach a 9+ pound rig to it. Even nicer seeing the entire sword and scabbard: I'm even more impressed. 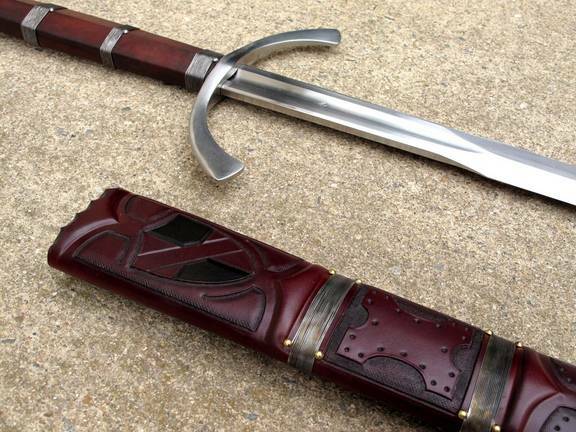 I've been a long-time facebook fan and am saving up for a scabbard for my Crecy from you. Keep up the awesome work! I was wondering if you had any photos of the completed Doge scabbard you posted WIP pictures of a while back? I didn't see anything on your facebook or on your main page. 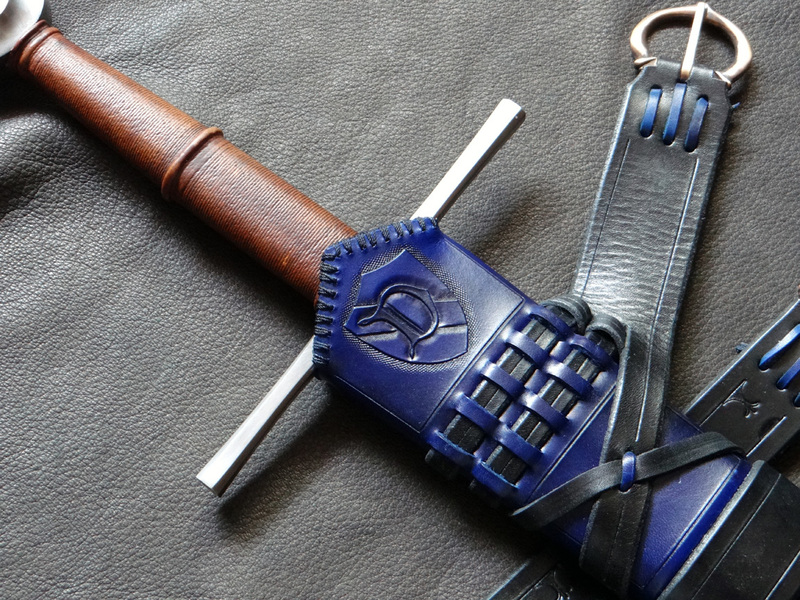 I was just curious since it has such an unusual shape to work a scabbard around.